I READ A WHILE BACK, WHERE SOMEONE WANTED TO HAVE THE LONG BEACH BREAKWALL REMOVED TO ALLOW SURF BACK INTO THE AREA. IF YOU THINK THE MALIBU LAGOON IS POLLUTED WAIT UNTIL YOU PADDLE OUT THROUGH THE L.A. RIVER. 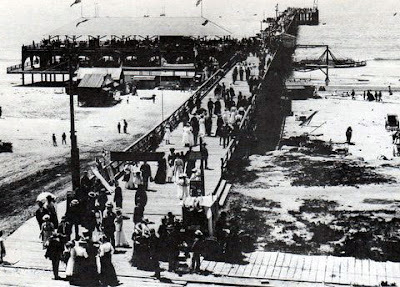 THE PIER STOOD AT THE LOWER END OF PINE AVE. 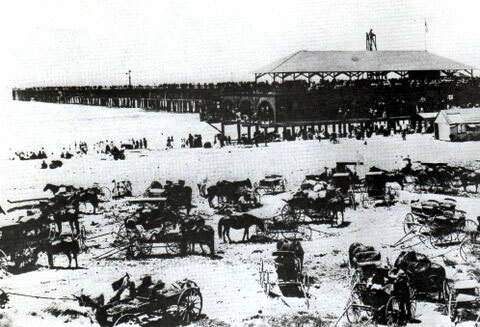 IT WAS A MAJOR LONG BEACH ATTRACTION IN THE ROARING 20’S WITH SEAFOOD, BANDS, AND DANCING PACKING THEM INTO THE PAVILION ON SUMMER NIGHTS. THE BOARD IS SHAPED LIKE MANY WE SEE IN PHOTOS FROM THE EARLY DAYS OF SURFING. 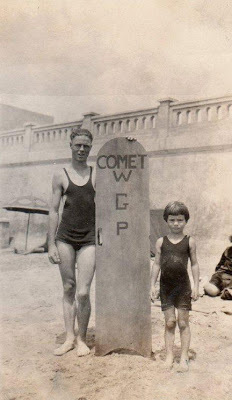 THE NAME “COMET” PAINTED ON THE BOARD SEEMS TODAY A LITTLE PRESUMPTUOUS, BUT THE CARRY HANDLE CUT INTO THE RAIL WAS WAY AHEAD OF IT’S TIME. UNFORTUNATELY, THE COMET DID NOT SURVIVE THE RIGORS OF TIME, A LOSS FOR THE SURF COLLECTORS. GORDON PASSED ON IN 2000 AT AGE 90, BUT NOT BEFORE HE SHARED THIS HISTORIC SURFING IMAGE FROM 82 YEARS AGO WITH US. GOOD SURFING AND FISHING GORDON.